Right here you will find all the information you need to be successful with email marketing. Without doubt email is the most powerful marketing tool used on the internet. So it makes sense then to ensure you are doing it properly. Effective emails will improve your success rate on the internet. Stop making mistakes with email now and start reaping the rewards today. 1. Why is email so important to the success of your business. 2. Why email is so important to your online marketing success. 3. Learn how to develop an effective email plan for your business and how to implement it. 4. The many uses that email can assist with in your marketing strategies. 5. How to build a relationship with your customers. 6. What is the secret to building that relationship? 7. What tools you can use to develop the relationship. 8. Gain an understanding of the various types of mailing lists to use. 9. Learn about the most effective type of list that will explode your business success. 10. How to write an effective message targeted to your market to produce a profitable result. 11. Why "spam" is such a bad thing to do. A potential short term gain that will lead to long term failure. 12. How to measure your results. 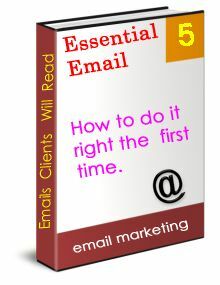 AND there is a whole lot more within the essential email eBook. The investment to purchase this eBook is $3.67US through paypal. This eBook is in pdf format ( need adobe reader, freely downloadable). I have been on the internet since 1995. By combining my marketing degree knowledge and experience I have over the years learnt a lot about email marketing. Along the way I have made my fair share of mistakes. But each mistake has taught me a valuable lesson. This eBook will save you considerable time and frustration because you will have an overview of the pitfalls to avoid and the strategies for success. The sum of my marketing knowledge, experiences and mistakes is contained within this eBook.